Ok, I’m kind of busy these days so I haven’t got time for the most elaborate posts — but anyway, as some of you might know I’ve teamed up with WooThemes to create theme packages for my publishing engine of choice; ExpressionEngine. 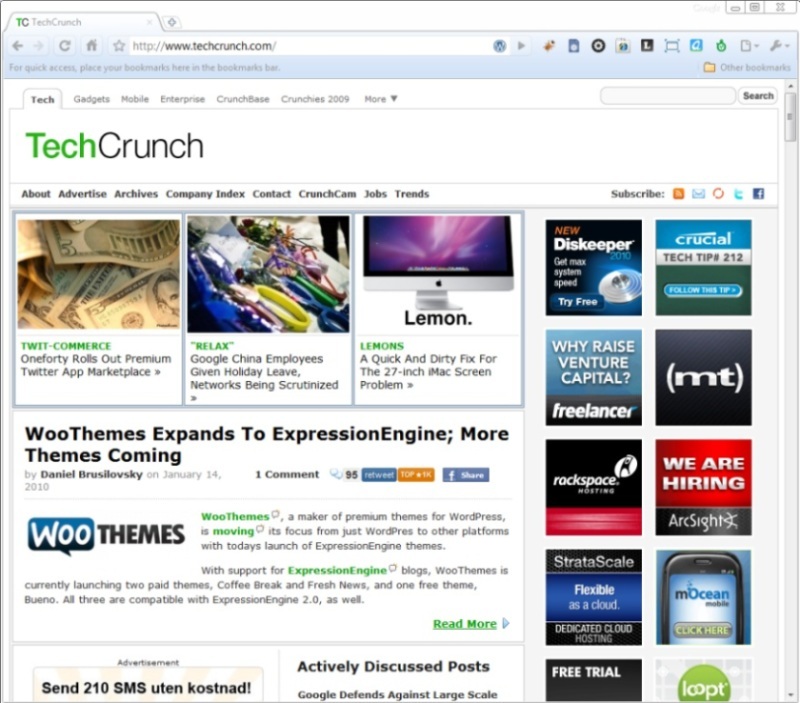 I think that’s great, both for WooThemes and EllisLab/ExpressionEngine. The author’s tweet (300k followers) + TechCrunch’s tweet (1,3m followers) + general Twitter crazyness with the “woourl.com/ee” being passed around, resulted in the rsaweb guys working their butts off to keep the server up (it went down a couple of times as well, but all in all they did a good job). It’s exciting times, since we’re basically testing out some new grounds here; is there a market for premium ExpressionEngine themes? Who knows. I hope so, and it’s going to be interesting to see how the traffic and hype converts to actual sales. I would think that the majority of people who buy blog themes would probably look at EE and think: “I’ve got to buy a licence too!? Why shouldn’t I just stick with WordPress?” In most cases the answer to why you’d choose EE over WP would be to provide the flexibility and extensibility that WP can’t provide, but are blog theme buyers really in the market for that extra power? I’m doubtful. Bjørn! Big congrats to you and the rest of the team!!! Testing Bueno EE theme as we speak!! V Easy to set-up!! John; yeah I know, we might need to turn it up a notch, maybe provide forum theme as well and sell it like a “social website community bundle in 1-2-3” ;-) .. we’ll see how it goes. It had to be tested sooner or later. I’m having the same thoughts as John, but I definitely hope it works out for you guys! I downloaded the Bueno theme to check it out. Mike; lol, no where did you get that? I’m twice that age :-P .. 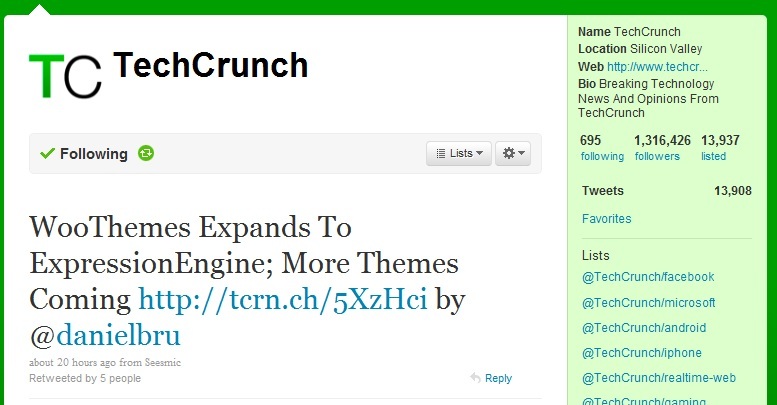 I guess you’re talking about the TechCrunch columnist, he is 17. Anyway, yeah, maybe we need to market the themes more as starting points for great websites (not so much blogs which is what currently works great for woothemes when it comes to WP). We’ll see, it’s going to be interesting. Sorry Bjørn! For some reason I got you mixed up with with that Daniel Brusilovski fella. LOL @ Mike I had the same reaction. “Wtf…17…entrepreneur…CEO…give me a f**** break, can this kid even legally earn $” LOL…to the power of marketing eh? EE themes will never take of, as John said avg. blogger will not drop $300 for EE. And why would they if all the want to do is blog+AddSense and WP is superior to EE in that category. But there is always those people that buy SUVs “just in case they need 4WD”…so some will buy EE and themes but never use its power beyond blogging…tight market. Second, EE themes are not limited to blog themes. Yes, the first themes we released were blog-focused, while our second batch was more business/product oriented.